Readers to Eaters, 9780983661559, 96pp. Where there is food, there will be laughter (and crumbs). Poetry is food for the soul, food is poetry for the tongue. 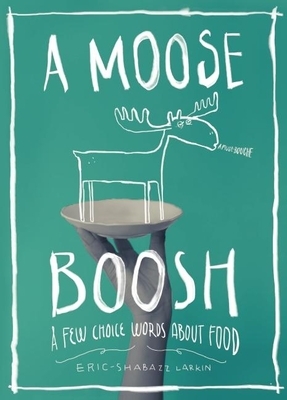 Food writer Michael Pollan calls A Moose Boosh a "very funny book" while Kirkus Reviews says it is "a kid-friendly companion to Michael Pollan's Food Rules." The American Library Association named the book a 2015 Notable Children's Book and says "Readers and eaters are taken on a comical romp through the world of food using poetry and a visual feast of photographs enhanced with playful doodles." Eric-Shabazz Larkin made his author/illustrator debut with A Moose Boosh. He made his picture book illustration debut with Farmer Will Allen and the Growing Table. Eric-Shabazz Larkin didn't discover he had a graffiti artist inside of him until he drew the city skyline on the wall of his childhood home in Virginia. He made his picture-book illustration debut with Farmer Will Allen and the Growing Table, an American Library Association Notable Book. A Moose Boosh marks his author-illustrator debut. He lives in New York City.